Corsham Regis is one of a handful of schools selected to trial a new scheme to support school gardening. And there are benefits for you too! get 5% discount in lots of UK garden centres like Whitehall and Lowden. Even better, 5% of what you spend is donated to our school funds. School gardening has been shown to benefit pupils’ physical health, mental wellbeing, behaviour, social skills and concentration. We are taking part in this scheme as we are looking to raise money to go towards improving the allotment area and other outdoor spaces, and we need your help with this. Example: If you order a gift card for £100, it will cost you £95, saving you £5 and the school will receive £5 too. 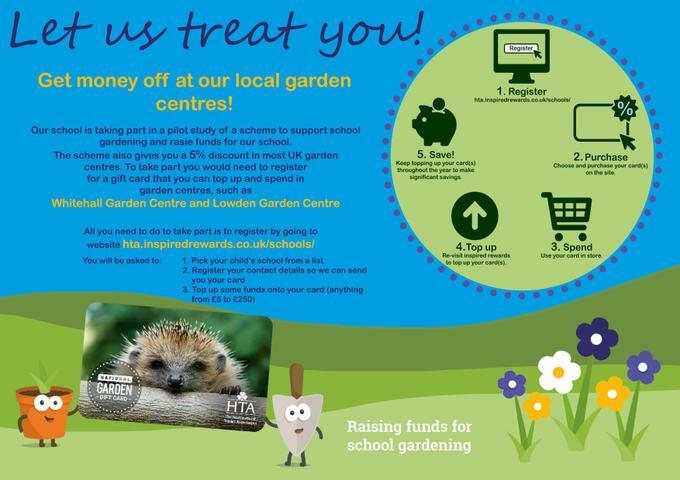 in garden centres and help raise funds for Corsham Regis please visit https://hta.inspiredrewards.co.uk/schools/ today.